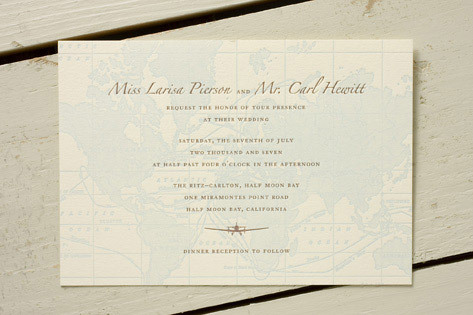 This travel-themed letterpress wedding invite suite, featuring letterpressed map and compass motifs and a passport menu card, is perfect for the couple who is ready to explore to the ends of the Earth together. The suite is letterpress printed on Crane Lettra ecru paper and includes optional ribbons, decorative paper, pocket folders, and colored envelopes. Available in robin's egg/coco, champagne/rust, and sand/merlot. Fonts shown are Zapfino and Granjon.